The worst recession of the past half century, the 1980-82 double dip, produced a drop of only 3.0 percentage points. I don’t think anybody has ever used the modifier “only” to describe that recession before, but it fits now: the current recession has produced a drop of 4.6 percentage points so far. That’s double the postwar average. 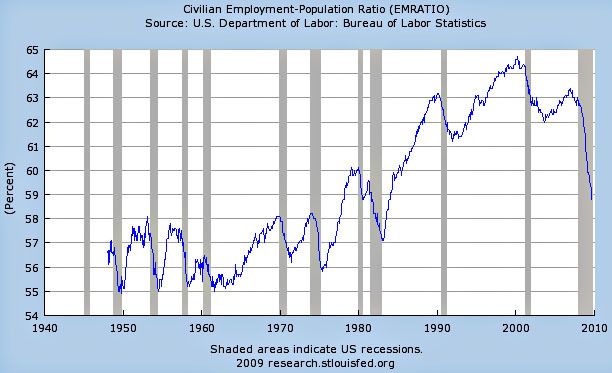 The drop from the previous peak in 2000 is 5.9 percentage points. So far. The job scene is simply devastating right now. More from Andrew Samwick here and Brad DeLong here.